Summer is coming and with it brings the 33rd International Kodály Summer School. 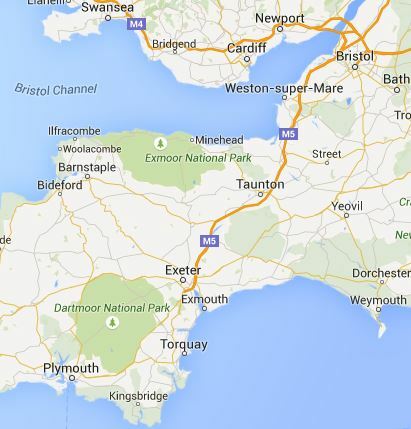 If this is your first BKA Residential then you are entitled to an £80 discount. Discounts are also available for full time students and BKA members who attended the last Summer or Spring Residential. If you want to spread the cost of the course then do get in touch about setting up a payment plan. Any questions about the course should be directed to the course administrator Judy Hildesley on judyhildesley@btinternet.com. Book now to reserve your place or take a look at the wonderful range of activities available this year. James Cuskelly‘s Musical Listening workshops are being run on Monday, Tuesday and Thursday afternoons as optional classes on the Kodály Summer School. Students beginning this course on Monday will be expected to attend all three sessions and the Friday afternoon session will be Singing Games with Lucinda Geoghegan. Each workshop will be offered twice: first in Session Two with a repetition of the material in Session Three each day. In this session participants will look at a range of activities based around listening to the Afro-American spiritual “Sinner, please doan let this harvest pass”. Essential characteristics of the genre will be explored through a range of song materials and singing games. The ongoing sequential development of aural musicianship skills will be embedded in the overall outline and guided listening segments will be incorporated. The activities in this session would be suitable for upper primary or lower secondary students. Listening activities within the Kodály approach are usually centred on a piece of Art Music, taken from the historical academy. In this session participants will look at a range of activities based around listening to the music taken from the 1993 movie, “Schindler’s List”. In the modern world, many composers consider film score writing as both a practical means of earning a living as well as a platform to push compositional boundaries. The ongoing sequential development of aural musicianship skills will be embedded in the overall outline and guided listening segments will be incorporated. The activities in this session would be suitable for secondary students. While this session is a follow on from the ideas canvassed in the Session 2, this is also a stand-alone session and all are welcome to attend. This session will focus on the second movement of the Gorecki “Symphony of Sorrowful Songs” and will consider the musical materials in the historical context as well as exploring the specific compositional devices relevant to the piece. The ongoing sequential development of aural musicianship skills will be embedded in the overall outline and guided listening segments will be incorporated. The activities in this session would be suitable for more advanced secondary students. János will be giving individual singing lessons at the Kodály Summer School 2015. Dr János Klézli, Baritone, began his musical studies in his native town, Szekszárd. He studied violin, piano and voice. After completing his conservatory studies he was admitted to the Voice Department of the Liszt Academy of Music, Budapest where his professors were József Simándi and Zsolt Bende. He graduated with honours in 1988. In May 2003 the Doctor of Liberal Arts (DLA) in performing arts was conferred upon him at the Liszt Academy of Music. Since September 1988 he has been teaching at the Liszt Academy of Music, Budapest; he also teaches voice training at the Zoltán Kodály Pedagogical Institute of Music, Kecskemét. János gives concerts regularly and his repertoire includes works by Baroque, Classical, Romantic and contemporary composers. He has taken part in performances of several opera and oratorios, among other works by Purcell, Bach, Haydn, Buxtehude, Händel, Mozart, Schubert, Vivaldi, Liszt, Kodály and Arvo Pärt. He regularly gives master classes in Hungary and abroad. 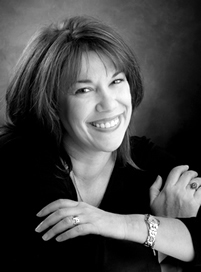 Dr. Susan Brumfield is Professor of Music Education at Texas Tech University, and holds a Ph.D. in Music Education from the University of Oklahoma. 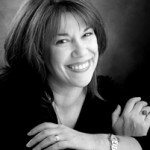 She is widely known throughout the United States and the United Kingdom as a clinician, consultant, author, composer, arranger and conductor of children’s choirs, and is an internationally recognized Kodaly educator. Frequently in demand as a guest conductor, Dr. Brumfield is the Artistic Director and Conductor of The West Texas Children’s Chorus. Dr. Brumfield is a program author for the national series music texts, Silver Burdett Ginn Making Music, and a contributing author for the Hal Leonard magazine for classroom music teachers, John Jacobson’s Music Express. Dr. Brumfield’s choral music is available through Colla Voce Music and Hal Leonard Publications. She was invited by the International Kodaly Society to represent the United States with a new choral composition commissioned for the internationally released IKS publication Music: A Universal Language. Dr. Brumfield teaches in Kodaly certificate programs throughout the country. She serves as Academic Director of The West Texas Kodaly Initiative, and holds the same position in courses at Portland State University and Westminster Choir College. Dr. Brumfield has conducted extensive field and archival research in England and Scotland, tracing the roots of American folk music in traditional British music. Her most recent publications, Hot Peas and Barley-O: Children’s Songs and Games from Scotland, and Over the Garden Wall: Children’s Songs and Games from England are available through Hal Leonard Publications. She is currently at work on Giro Giro Tondo, a new collections of children’s songs and games from Italy for use in the music classroom, and on a series of pedagogy materials for music teachers. James is Head of Music at St Aidan’s Anglican Girls’ School, Brisbane, President of the International Kodály Society, Director of the Summer School Music Program, and Director of the Cuskelly College of Music. He completed undergraduate studies and a Diploma of Education at the University of Queensland. The Kodály Certificate from Holy Names College (California) was awarded in 1991 and the Master of Music Studies (The University of Queensland) in 1997. He gained the Doctor of Philosophy (The University of Queensland) in Music Education in 2007. He was Head of Music Education and the Aural Musicianship Program at the University of Queensland from 2000 – 2010, and during that time received two awards for Excellence in Teaching. James has a very broad base in education, having taught in Kindergarten, pre-school, primary and secondary classrooms as well as in tertiary institutions.His passion for music, and his ability to enthuse and bring about effective learning in students across all ages or abilities, is internationally recognised. He is frequently asked as guest presenter and keynote speaker, and recently has taught at the Kodály Pedagogical Institute (Hungary), in the National Youth Choir of Scotland Summer Program and in the National KMEIA Conference. James is committed to teacher training in music education, is considered a global leader in music education and directs internationally recognized programs. 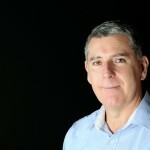 He runs a variety of accredited teacher training programs including the Summer School Music Program (Brisbane) and The Australian Kodály Certificate programs in Malaysia, Perth and New Zealand.A talented musician in his own right, James is also a highly regarded choral conductor and clinician. He is founding Director of the Queensland Kodály Choir and conductor of the women’s performing ensemble, Valency Ensemble. 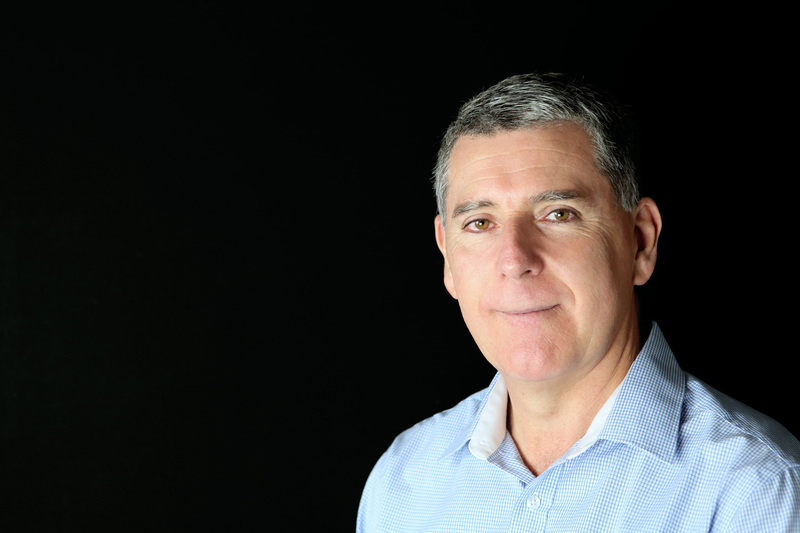 He is frequently asked to run choral workshops and lead choral festivals and workshops, and each year James convenes The Big Sing, a community choral festival held in Brisbane. 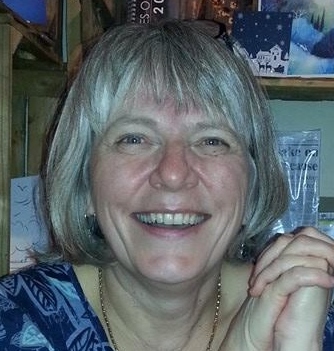 Sally is a singer and musicianship teacher living in Bingley, West Yorkshire. For many years she was a class teacher and KS2 Maths Co-ordinator. Whilst teaching in the middle school she set up a project, working with a group of children from the local special school, and their teacher – Judith Brindle. The project involved singing and playing musical games together and was Sally’s first ‘proper’ introduction to the Kodály Concept of Music Education. One of the aims of the project was to encourage Sally to incorporate her singing skills into the classroom. After the birth of her son, Sally attended courses run by Judith and The Voices Foundation. After hearing about the wonderful summer school from circa 1990 onwards, Sally finally made it to Leicester in 2003 and has attended the majority of summer schools since then, becoming a BKA tutor in 2014. For the last few years Sally has worked on projects, incorporating Kodály musicianship, for the Northern Orchestral Enterprise Ltd (NOEL) in Halifax and the Sing Up Outreach Project for Bradford Cathedral and, in 2017 Sally presented a series of workshops at the Bradford Music Education Conference. 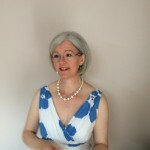 Sally teaches privately as well as singing as a soloist and in a variety of choirs. Since 2011 she has taught Kodály Musicianship in a state primary school in Queensbury, Bradford, West Yorkshire. Zoe is a Kodály trained Early Childhood Music Specialist with a wealth of experience of working in a wide range of Early Childhood settings. She also provides bespoke training workshops for early childhood education and music practitioners and is an Associate Tutor in Early Years and Primary Education at Edge Hill University. A former BKA Trustee, Zoe is an active musician playing the viola. 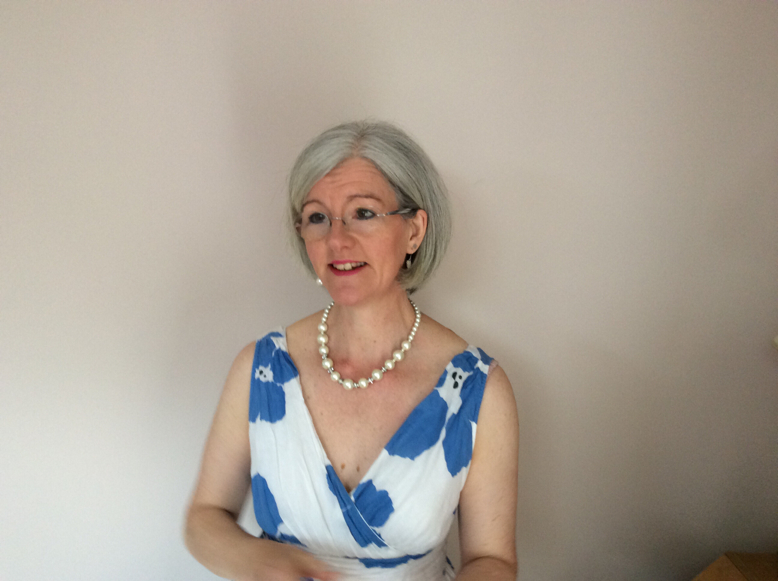 Her qualifications include MA Education, Early Years; PDC (Early Childhood Music, Kodaly); PGCE; BA(Hons); RGN. An introduction to Kodály philosophy, an inspirational concept of music education. 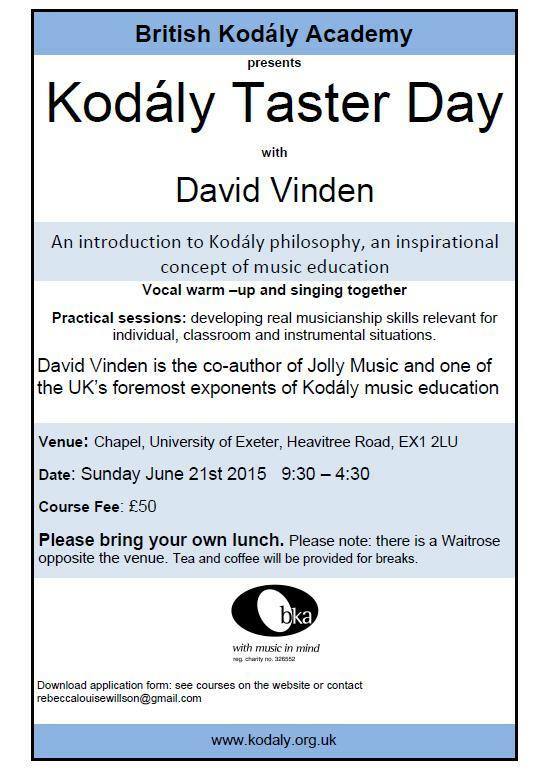 David Vinden is the co-author of Jolly Music and one of the UK’s foremost exponents of Kodály music education. Please bring your own lunch. There is a Waitrose opposite the venue. Tea and coffee will be provided for breaks. These fees were for the 2015 applicants. Updates for 2016 will be added here when confirmed. A deposit of £100 is required to secure your booking. 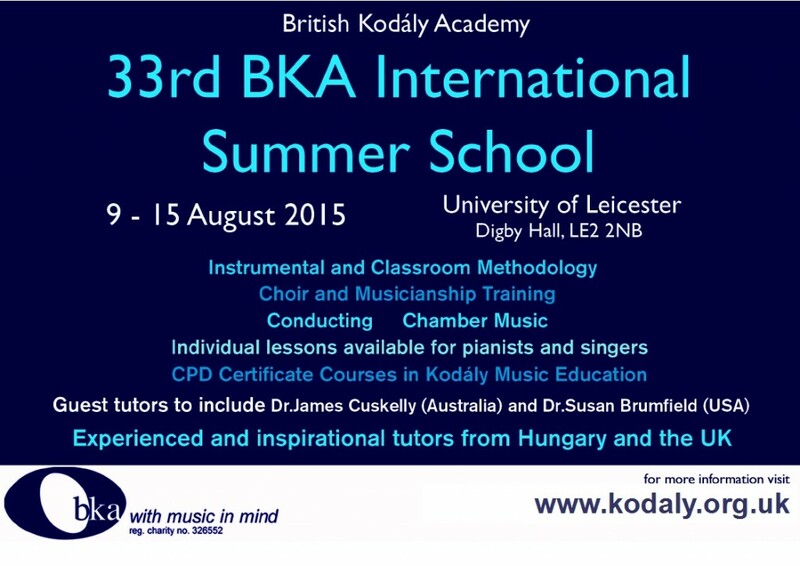 To book your place, please complete the Kodály Summer School application form. The timetable for the Summer School for Level 1 Certificate Students can be found here. NB. When estimating the total financial investment in this course please allow for the cost of travel and any other related expenses for Study Days, musicianship assessment and lesson observations.